For this year’s Tenth Annual event, we are doing something different and, we hope, very special. Our world class line up of luthiers will be featuring women luthiers of note from around the world, as well as a prevalence of women performing artists and instructors. From renowned builders of international reputation such as Linda Manzer, Kathy Wingert, Joshia de Jonge, to younger up-and-coming makers dedicated to the craft, like Maegen Wells, Jayne Henderson, an appreciable percentage of this year’s exhibiting luthiers are women. Our makers of fine instruments will be gathering from across the USA, Canada, England, France, Italy, Switzerland, and the Canary Islands! Performing artists and clinic instructors will include Della Mae, Rory Block, Cindy Cashdollar, Michael Chapdelaine, Vicki Genfan, Cathy Fink & Marcy Marxer, Mary Flower, Jamie Stillway, Tony McManus, Julia Toaspern, Happy Traum, Larry Campbell & Teresa Williams, and many, many more. 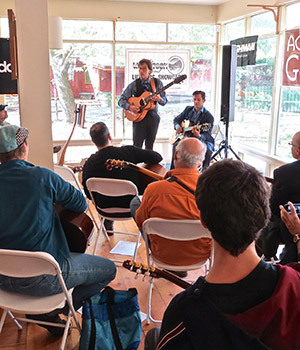 There will be continuous live music, including luthier mini-concerts, demos and special appearances during show hours, 11:00 AM to 6:00 PM on Friday, Saturday and Sunday, by some of the world’s finest musicians, in the Bearsville Theater Lounge, included in the price of admission. There is a series of Instructional Clinics and Workshops for players, plus seminars and colloquia for builders, by separate admission. Off-campus concerts (separate admission) include a Thursday night Kick-Off Concert at The Colony, Woodstock, October 26, and our acclaimed annual String Sampler Concert of acoustic music featuring Della Mae, The Maria Z Ensemble and Michael Chapdelaine on Saturday, October 27 at the Woodstock Playhouse. 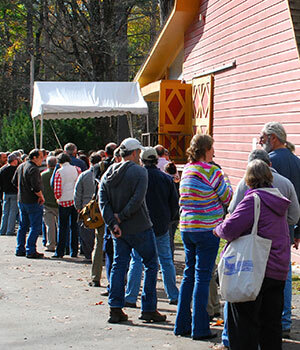 There will be Special Events and Special Exhibits on the Bearsville Theater Campus - all included in the price of admission. There will be a FREE class, Learn to Play Guitar in a Day® taught by Marlene Hutchinson at the Kleinert/James Center, 36 Tinker Street in the heart of Woodstock on Sunday, October 28 from 11:00 AM to 4:00 PM. It is highly recommended that you register early for this event. Click here! It's three days of Acoustic Guitar Heaven. See the listings for exact days and times for all events and ticket information, as well as listings for accomodations if you're planning on staying in the Woodstock-area. The Traditions Award is given to those individuals who have strived to nurture, promote and preserve the acoustic guitar, to acknowledge their innovations, influence and legacies, and to thank them for their support of the Luthiers Showcase. 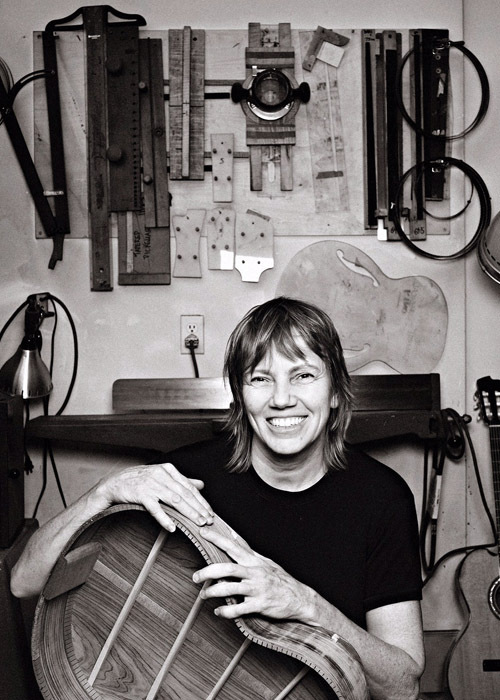 Linda Manzer is a giant in the realm of acoustic guitar making. She has been designing and building world-class flattop and archtop acoustic guitars since 1974. For the craft of making flattop guitars, she studied with Jean Larrivée 1974-78. She went to New York in 1983-84 and studied archtop building with Jimmy D'Aquisto. In addition to her standard models, she has designed and built by hand over 50 guitar prototypes, including the soprano guitar, the first acoustic baritone guitar, the acoustic sitar guitar, and several multi-necked harp guitars. Additionally, Linda has designed and built over 25 instruments for jazz musician Pat Metheny, including the Pikasso, which has 42 strings and four necks. Professional musicians who own Manzer guitars include Julian Lage, Carlos Santana, Henrik Andersen, Milton Nascimento, Bruce Cockburn, Paul Simon, and Gordon Lightfoot. Linda also organized the Group of Seven Guitar Project with six other Canadian Luthiers at the McMichael Gallery in Kleinburg, Ontario, which is an homage honoring the much-loved Canadian Group of Seven Painters. It tells the story of two parallel groups of artists: Canada’s famous Group of Seven Painters, and seven luthiers who have come together to honor their work through seven original guitars inspired by the paintings. 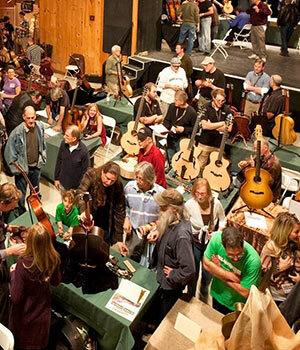 We greatly appreciate her participation and support over the years for the Woodstock Invitational Luthiers Showcase. Thank you, Linda, for carrying on the Traditions. 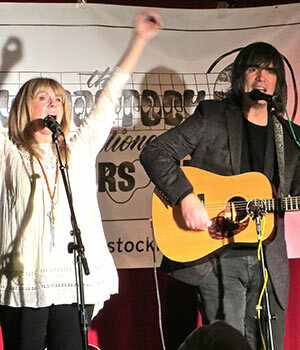 Woodstock, NY is the internationally known art and music community with a deep pool of notable local talent. Only a two-hour drive from New York City, October is peak autumn foliage season in the heart of the Catskill Mountains.